Our country India is well known for tasty food. We all Indians are fond of food. Where ever we go may it be freaking out with friends, outings with family, party, marriages, etc we first think whether we’ll get good food or not? The secret behind our tasty stuffs is Indian Spices. In every part of India we found different spices as per the climate. The list of our spices is endless. Would name few of them Adrak, Choti elachi, badi elachi, Anardana ,Chironji, Dalchini, dhania, haldi, Gud, jeera,kadi patta,Harar, Kasoori methi,hing, Ajwain. The list goes on and on. Curry leaves also known as meeth neem are strong in aroma and taste. Hence is the reason of adding in most of the cuisines. As curry leaf is my favorite spice I add in most of the dishes I make at home like sambhar, dhokla, idli, Upma, Chutney,etc. Love its aroma. Curry leaves adds great taste in all dishes. Select curry leaves that are attached to stem. Also choose the fresh ones and without spots. Whole, chopped, as a topping. Would like to add once I was in Ludhiana with my husband, he had gone there for office work. When I went there I had tough times finding curry leaves. Many people were unaware of curry leaves and those who were aware use to grow the plant in their gardens only. So I use to store them and use whenever required. I also have a curry leaf plant at home. Store the curry leaves along with the stems this would enhance their life. You can wrap them in newspaper and keep in refrigerator or else store in a box with a hole and keep it in refrigerator. Break leaves from stem only when you have to use them. 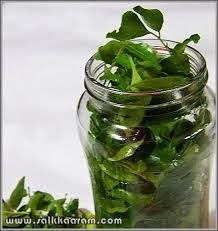 Well you can also dry the leaves, make a powder and carry with you but the aroma would be less as compared to fresh one. Apart from widely used in cuisines, it is widely used in Ayurvedic medicines as herbal tonic, stimulant. 1. It helps in preventing early development of cataract. 2. It helps to boost the blood circulation. 3. It is used to eradicate irritation, swelling. 5. It prevents skin eruptions. 6. It can also be used as hair fall solution. 8. By consuming 8-10 curry leaves in the morning reduces blood sugar and high cholesterol. 9. It is also useful in treatment of Nausea. 10. You can also use roasted leaves to stop vomiting. 11. 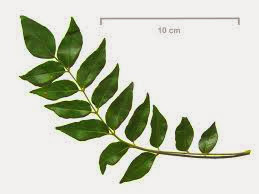 Curry leaves can be consumed to reduce tummy ache. 13. Paste of curry leaves can be used to heal wounds. How to use curry leaves for hair fall problem? Take a bowl put 100 ml coconut oil and 10-12 curry leaves and heat it for 5 minutes. Filter it and keep till it is cool. Apply on hair regularly will stop the hair fall.